Deputy Minister Thabang Makwetla visited Atteridgeville Correctional Centre on 22 January 2019 to gain insight into its operations. This forms part of his routine visits to evaluate correctional centres in order to understand challenges, recognise achievements and identify opportunities. The centre which is situated in Thaba–Tshwane, west of Pretoria is one of the six centres under Kgoši Mampuru II Management Area in the Gauteng region. Mr Makwetla kicked off proceeding by holding an intimate session with management and later toured the facility. He appreciated the welcoming ambience at the centre and said that it was well maintained. Makwetla was however unhappy with how the agricultural resources were minimally used by the centre. He said the management of the department has committed to turning correctional centres to become self-reliant, but acknowledged that implementation remains a challenge. He said in their plans, the management of the centre should consciously work on growing the capacity and the activity of the land available. “I can see the potential of growing agricultural produce in a number of centres that I have visited which is not optimally exploited,” he bemoaned. Atteridgeville produces fresh vegetables in their garden of 15 hectors and currently revamping its orchard of about 7.72 hectors. Although land is available, limited human resources remains a challenge in maximizing production in the fields. 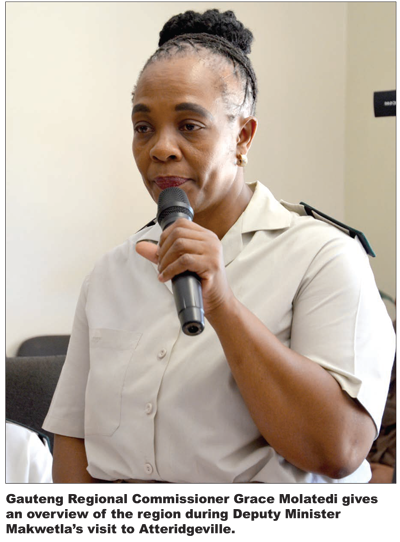 There are 161 correctional officials looking after 831 offenders in the centre. The facility has an approved bed space of 608 and it is overcrowded by 34.98%. The centre houses sentenced medium male offenders serving sentences from one month to 6 years. Mr Makwetla raised his concern about the community of offenders in the centre who are not prioritised for skills development and education. He said the centre should plan to increase the level of skills development and education in the centre. 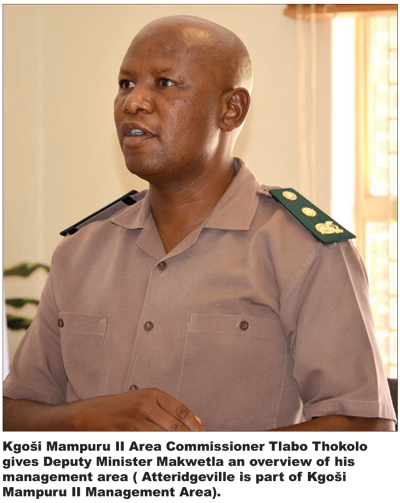 Area Commissioner for Kgoši Mampuru II Management Area, Tlabo Thokolo explained that the centre does not offer formal education programmes and offenders are usually not involved in skill development and education because of their short sentences. There were about 31 offenders enrolled for Adult Basic Education and Training level 1 to 3 and 29 involved in skills development in December 2018. Although the centre has limited space for learners the school which was started last year is slowly gaining momentum. Atteridgeville Correctional Centre was established in 1989 as Voortrekkerhoogte prison and renamed in 1998. It has two underground cells that were used to detain soldiers who transgressed. Today these cells are used to store agricultural equipment. Mr Makwetla also visited offenders detained in the single cells including Oscar Pistorius who was recently moved to the centre. Pistorius is the only offender serving a longer sentence of 13 years and six months at the centre. Deputy Minister Makwetla was accompanied by Chief Operations Commissioner Mandla Mkabela, Chief Deputy Commissioner Incarceration James Smalberger and Gauteng Regional Commissioner Grace Molatedi.